Blurb: Until recently, Zoey Redbird was an average high-school student worrying about grades, boys, and breakouts. But priorities have a way of changing when you are Marked as a vampyre, enroll in the vampyre academy House of Night, and have to figure out a whole new social hierarchy, affinities for elemental magic, and physiological changes that make you crave blood. I have to say I was just a little bit disappointed with this. It wasn't bad, it just wasn't as good as I had expected. I had a problem with the fact that the storyline & characters didn't mesh well with the books. It was more humorous than the books, and makes light of several of the situations that Zoey faces. I honestly wanted to like this, because I enjoyed the books, but I just couldn't get into it. Maybe it was just me, I didn't like that it strayed so much from the way the main characters acted in the books. The dialog just didn't seem to match what I would have expected from the characters. However, the artwork, both on the cover and inside, was great. I loved it. Being a fan of the series, it was really nice to have a visual representation of the characters that I have grown to love. Fantastic artwork. 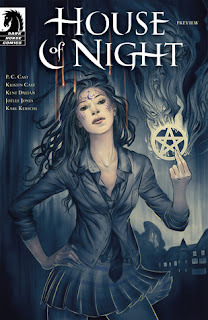 I guess overall I would say that you may like it if you were a die-hard fan or if you haven't read the books yet and want the general feel of the House of Night world. It was good, just not as good as I'd hoped.